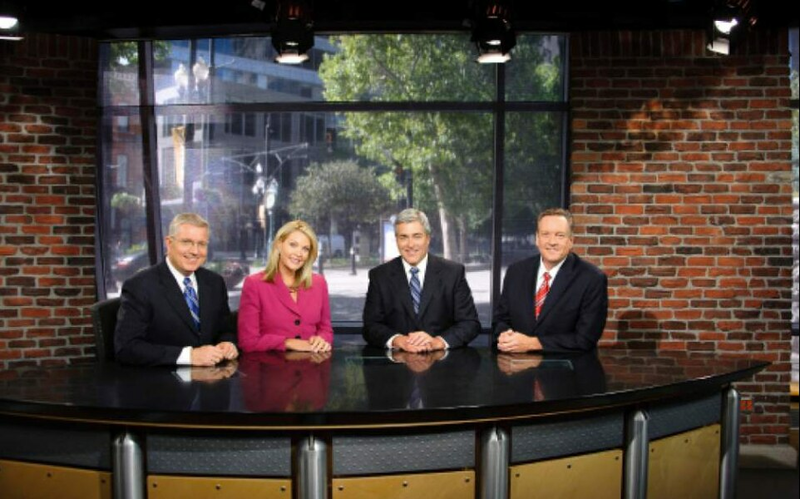 (Courtesy KUTV) KUTV's Sterling Poulson, Shauna Lake, Mark Koelbel and Dave Fox on the set at Channel 2. A couple of weeks ago, I told you how the local TV stations’ newscasts stacked up during the February sweeps, based on the numbers from Nielsen. To summarize: KUTV-Ch. 2 had the most viewers, but FOX 13 had the most viewers in the lucrative age demographics — 18-49 and 25-54. But Nielsen isn't the only ratings service. It's by far the biggest player in the game, but it has a competitor — Comscore. KTVX-Ch. 4 doesn't even subscribe to Nielsen, it's Comscore-only. And other stations at least look at the numbers, and use them to sell advertising if they work to their advantage. According to Comscore, KUTV led second-place KSL-Ch. 5 by a huge margin in the Monday-Friday late news — roughly a third — in total households, households with viewers 18-49, and households with viewers 25-54. If you add the numbers from the KUTV simulcast on KMYU, that newscast leads KSL in those three categories by 37 percent, 34 percent and 34 percent, respectively. And FOX 13 was a tiny percentage behind KSL in all three measurements. What does this mean? Again, it depends on whom you ask. Some scoff at Comscore. And some are quick to point out that Nielsen has 505 metered homes in the Salt Lake television market, Comscore has 142,000. That's not a misprint. And, yes, it seems unbelievable to me, too. There are some huge discrepancies in the results. According to Comscore, KUTV averaged 96,115 homes for its 10 p.m. newscast in February; according to Nielsen, KUTV averaged 64,788. Comscore and Nielsen use different methodologies. Nielsen samples cable and satellite providers as well as those that use an antenna; Comscore draws its data from Dish and DirecTV subscribers. Certainly, that hurts KSL, which is not carried by DirecTV. Although Nielsen also samples DirecTV homes. There are plenty of other differences. Nielsen measures live-plus-same day viewing (including those who watch DVR recordings), Comscore is live-only. The two don’t agree on how many households are in the Salt Lake market, or its demographic makeup. I’m not a statistician or a mathematician, and I’m not making any sort of judgment about the validity of either system. I can tell you that I’ve heard all sorts of TV executives — both local and national — complain about Nielsen for decades, and I hear the same sorts of complaints about Comscore. Pierce: TV team of Andrew Catalon and Steve Lappas think there may be NCAA upsets in SLC. And they think USU will win. FOX 13 has new owners. The station is sold to Scripps. Similar margins were repeated for local newscasts throughout the day. Comscore reported that KUTV held substantial leads in all three categories at midday, in late afternoon and early evening. For the most part, KSL was second, edging out third-place FOX 13 while KTVX-Ch. 4 trailed. From 4:30 to 7 a.m., KUTV again had a big lead, with FOX 13 second. FOX 13′s 7-9 a.m. newscast led the KUTV-produced news on KJZZ-Ch. 14.